Quality Care Offered by Children’s Dentist in Friendswood! Were you one of many children that had dental anxiety growing up? It’s understandable to be apprehensive when it comes to your child’s first dentist appointment, as they probably are, too. As a parent, your little one’s comfort and safety is a main priority. We understand that and take it to heart at Friendswood Dental Group. Our children’s dentist in Friendswood keeps the office as an inviting place for your child to warm up to. Instead of transitioning from a pediatric dental office, begin here with us. Your family can avoid a stressful transition period and begin their oral health care journey by meeting one of our dentists, Dr. James Sierra or Dr. Carmac “Mac” Taylor Jr. The foundation for healthy permanent teeth is laid during the first years of life. It is essential to establish a proper oral hygiene routine as soon as possible. A regular routine will help to ensure the development of strong, healthy teeth and gums. As consistent role models, parents are key for setting a daily routine, walking their children through the important steps of oral hygiene. You can get assistance with this by visiting your Friendswood dentist. 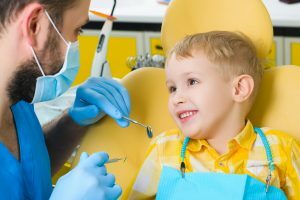 During your child’s appointment, either of our dentists will be equipping your child with important dental hygiene information and techniques. We hope to make you feel comfortable knowing that as the parent, you are not alone in this journey! Visiting your local dentist is a major part of a consistent dental routine. During your children’s first (or returning) dentistry appointment, one of our gentle dental hygienists or friendly dentists will conduct an examination. This is time dedicated to taking a good look at your son or daughter’s teeth and gums. If anything is unusual with the way your child’s teeth are developing, it will be addressed at this time. Early examinations provide not only the dentist, but you as the parent, the opportunity to be proactive in your child’s health. If there are any abnormalities spotted, we will be able to create the best regimen to counteract those issues early on. After examination, a kind member of our dental hygienist staff will gently clean your child’s teeth. During the quick rinse, he or she will teach your child the basics of dental care—depending on their age of, course! Friendswood Dental Group strives to equip your child with all the knowledge necessary to maintain their precious little smiles. We take pride in being a primary choice among family dentistry practices! Don’t worry, we have you and your family’s best interest in mind at Friendswood Dental Group. If you plan to be proactive in the health of your family’s teeth and gums, please contact us today to arrange a children’s dentistry examination. Both of our dentists love to see a variety of young patients from surrounding areas, especially the ones eager to learn! If this is your child’s initial trip to the dentist, please take the time to review the information listed on our new patient page. Comments Off on Quality Care Offered by Children’s Dentist in Friendswood!